Biggest disappointment of the year so far for us, is hip-hop artist Stalley, whom after a magnificant album last year (lyncoln way nights) turned out to be running from thoughtful and soulful hip-hop to gangsta rap, with Rick Ross as best friends. 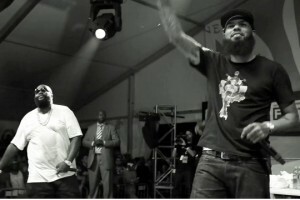 We love Rick Ross because he’s always been clear from the start. But Stalley ? The first reason we loved Stalley was for reinventing a type of hip-hop that only the roots care to defend now days so a question is ? Why are we so pissed ? Truth be told, it is hard to see that after one successful record, an artist who has been defending the authenticity of an america we don’t talk much about, runs towards the main, mainstream style. We didn’t need another gangsta rap, we needed, something else. And after promising us that something, the man runs like a thief. Going on videos not to talk about the music, about the importance of defending a style and defining it, the only thing that seem to occupy Stalley now days is how successful he is and he should become. Sad, sad sight to see.